In early Feb., Polaroid announced that they were closing their remaining film factories in Massachusetts, Mexico and the Netherlands. 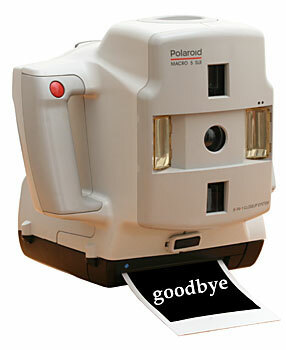 Polaroid will focus on products such as a portable printer for cell phones as well as Polaroid-branded electronics. This move leaves Polaroid with 150 remaining employees - way down from 1978 when they had almost 21,000 employees globally. For those offices that are still using the Polaroid Macro 5, we will continue to stock 990 film for as long as we can get it. As the 990 supply runs down, you can also use Spectra film which is sold in most convenience and grocery stores (at least the ones that still sell film). When Polaroid film is no longer available for your Macro 5, take a look at our digital cameras. All of them will give you much better quality photos and you can make 4"x6" prints for roughly 1/3 the cost of Polaroid film. We're proud to be able to offer Dr. Edward McLaren's latest publication. 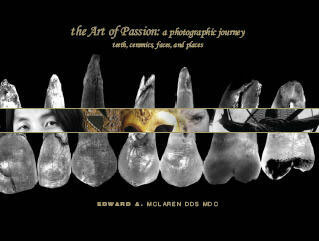 This book, “the Art of Passion: a photographic journey... teeth, ceramics, faces, and places”, represents several years of study, trial and error, and countless thousands of images both of film and digital in an attempt to discover the color characteristics, form, texture, and luster of natural teeth. The purpose of this study was to learn the optical behavior of teeth, and more importantly how to take this information and use artificial materials to create natural tooth optics in a dental ceramic restoration. We featured Dr. Lorne Lavine and Dental Technology Consultants a few years ago in our newsletter, but we thought it would be useful to highlight his knowledge and expertise again as we are constantly asked for a recommendation for an office technology expert. We have worked with Lorne for many years now and he is an invaluable resource when it comes to making sense of all of the new dental technologies. You can contact DTC at: http://www.thedigitaldentist.com. Dr. Lavine also has a dental technology blog where he keeps up with the latest in dental technology: http://thedigitaldentist.blogspot.com. 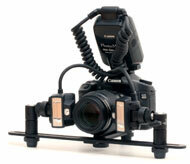 We have updated our R1 Dual Point Flash Bracket to work with Canon's MT-24EX Dual Point Flash. The R1 Bracket now includes flash mounts for Nikon's R1 macro flash, the Canon MT-24EX macro flash and standard flashes. choice questions.This brief survey is completely anonymous and does not send us any other information. We are only trying to get an idea where your "eyeballs" are. Thank you in advance for your time and your answers. Visit PhotoMed at the Hinman Dental Meeting in Atlanta, March 13-15. We will be in booth #705. Stop by and check out the latest in cameras, mirrors, retractors, books and anything else we can find that is useful for dental photography.